The trend for cars these days appears to be all about up-scaling, with 4x4s in particular taking over British roads at an alarming rate of knots. High ground clearance, superior 4-wheel traction and spacious interiors are all nice, but are they really necessary in Britain? 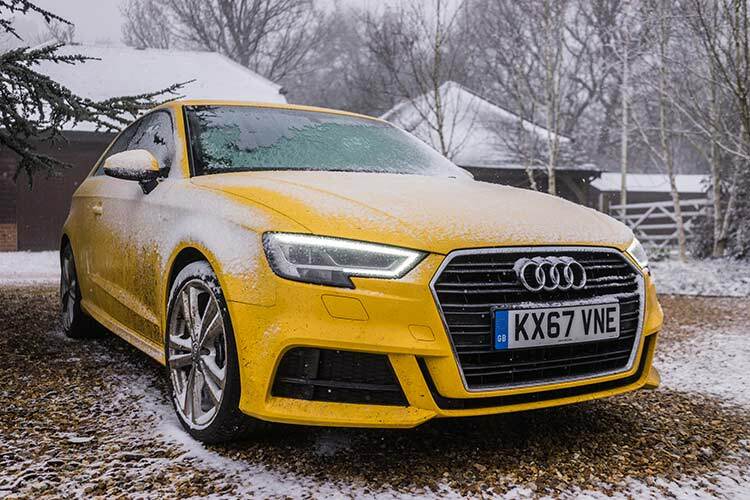 Visually, the new A3 certainly catches the eye; especially so in the Vegas yellow as seen on the test car. The colour really ‘pops’, and is complemented nicely by the S-Line level trim, which tweaks the body styling, pumps the wheel diameter up to 18” and lowers the ride height by 15mm. The angular design is typically Audi and to us works particularly well with the proportions of the A3. The weekend’s driving started off with navigating through some British B-roads towards London, predictably littered with pot holes and providing the suspension with a real workout. Considering the firmer dampers and stiffer springs fitted with the S-Line trim, the chassis handled the roads extremely well, with very few of the lumps and bumps felt cabin-side. Where traffic permitted, the 1.5 litre TFSI engine quickly built speed, providing performance which belied its diminutive capacity. 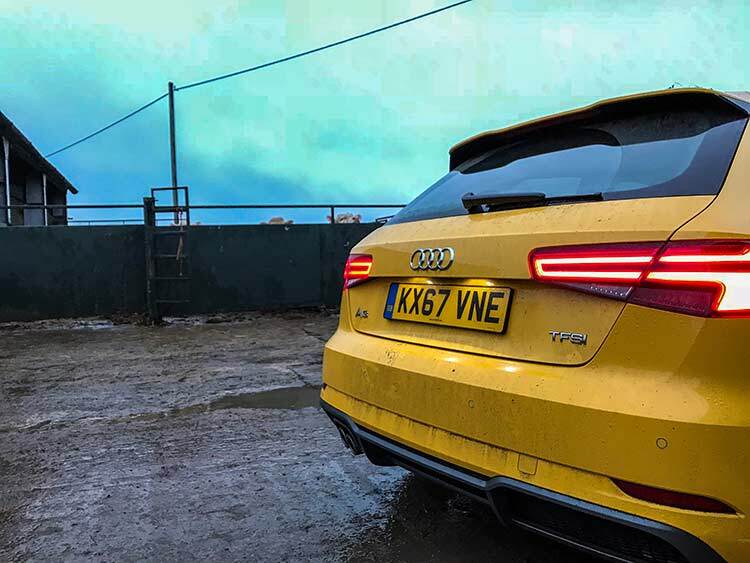 Pushing the A3 hard through the bends is an experience which proved more rewarding than anticipated, with the chassis seeming genuinely nimble and the increased suspension stiffness making the whole car feel very planted. Body role is well controlled, whilst the front axle provides impressive levels of grip, with traction difficult to break even with the electronic aids switched off. Our only gripe is steering feel, which seemed a little lacking, even with the power steering set to the most sporty ‘Dynamic’ mode. With fellow countryside venturers collected, it was time to take the A3 out of it’s typical comfort zone, heading off into the country 4 up with the boot brimmed. Rear passenger space and leg room isn’t terrible, but it certainly doesn’t qualify as spacious and would be a squeeze with 3 in the rear. Comfort was reportedly good though, although the rear seats simply couldn’t match the quality of the pair up front – trimmed perfectly in Alcantara and Leather (£550 option) they were a real joy to be in. 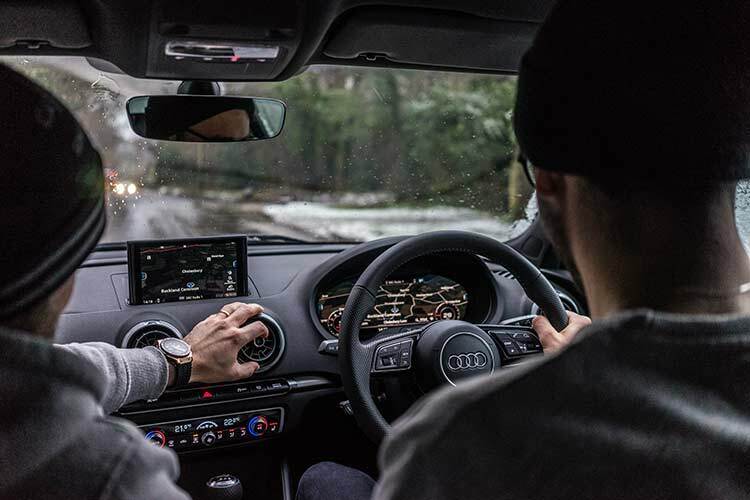 In-car tech is up to Audi’s excellent standards, with the digital instrument cluster a particularly nice inclusion (part of the technology pack, a £1395.00 option). 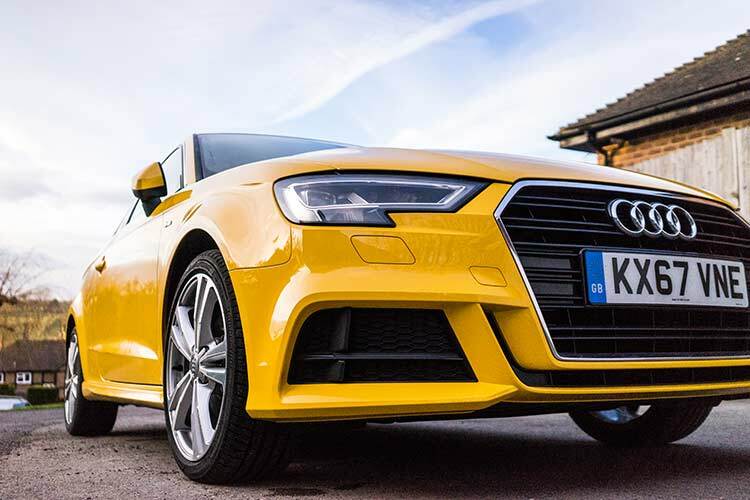 Whilst it’s easy to get complacent with technology, we can’t help but feel Audi absolutely nailed the options on our A3 test car. 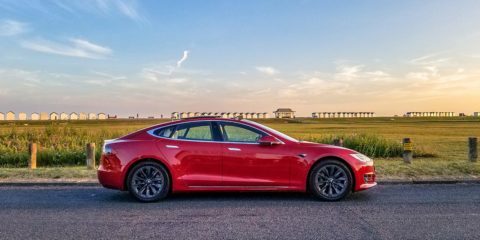 Every piece of tech fitted was used and worked flawlessly over the course of the weekend, highlighting just how good and dependable all these gadgets have become. 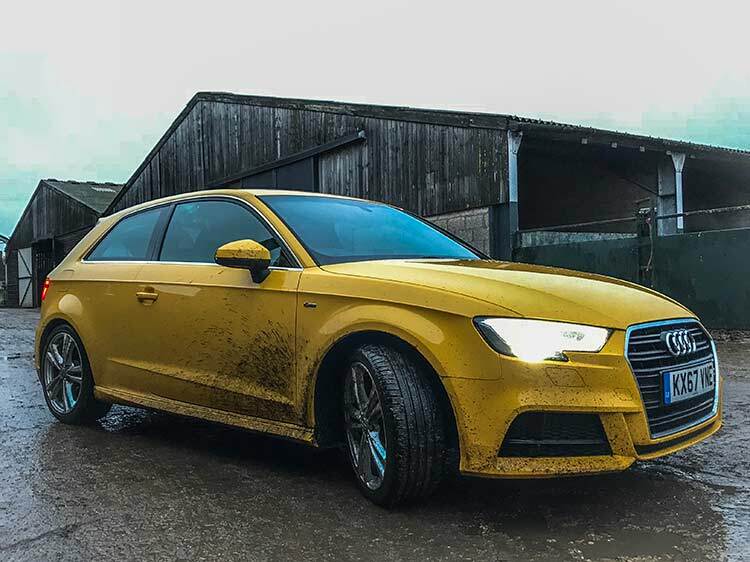 Moving away from the city, the roads quickly narrowed and a number of dirt (thick mud – thanks UK weather) tracks and bridle paths were even encountered, all of which the A3 handled with relative ease. Ground clearance (particular on our S-Line model) was the only concern, but traction rarely proved problematic with the clever electronic differential working hard to keep the front wheels driving forward. Not once did the A3 get close to being stuck. Returning to the car the following day, we were greeted by a blanket of snow, which had fallen overnight and continued to fall at a steady rate. In true British style we did the only sensible thing; return inside for breakfast, a cup of tea and to wait for the weather to settle. 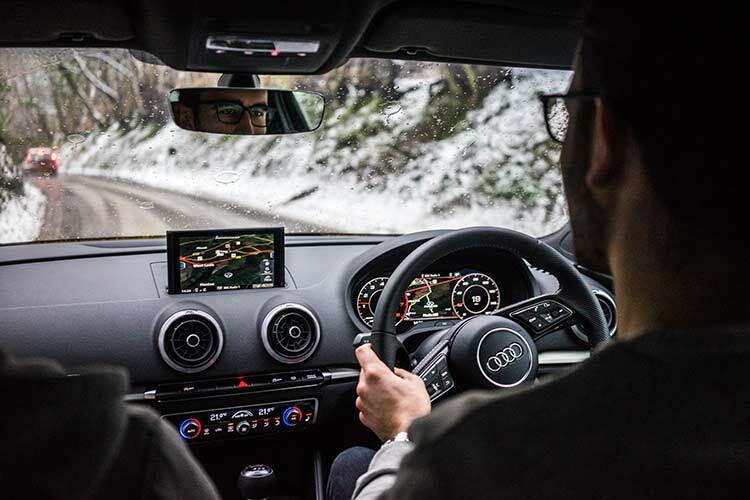 Once the snow had stopped falling, we ventured out on to the roads and were once again pleasantly surprised by the performance of the A3; the slippery roads weren’t a cause for concern, with the car feeling sure-footed throughout. 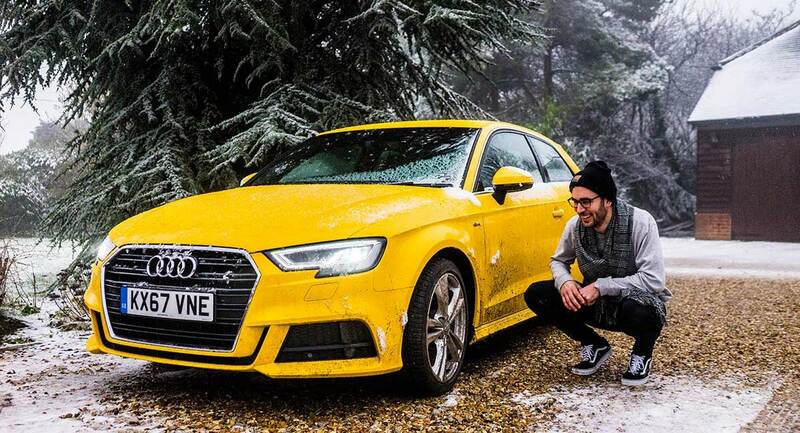 As the day progressed, the sunshine turned to darkness and the snow to rain, yet the A3 continued to impress and make us smile – this is a genuinely enjoyable and engaging car to drive. Despite throwing city driving, off-roading and appalling road conditions at the A3, it still managed to return a decent 43mpg over the weekend. It’s also worth noting this was whilst running in ‘Dynamic’ mode the entire time – switching to Eco mode and driving more frugally would surely push this to around 50. We’re lucky enough to drive some exciting, high-end and expensive cars at MSF, for which we’re very grateful. 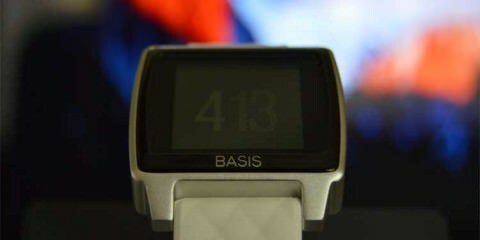 The only downside to this is that you can lose touch a little with the mainstream market, as well as what’s actually realistic as an everyday purchase. The new A3 is good looking, packed with useful tech, comfortable to be in and fuel efficient. 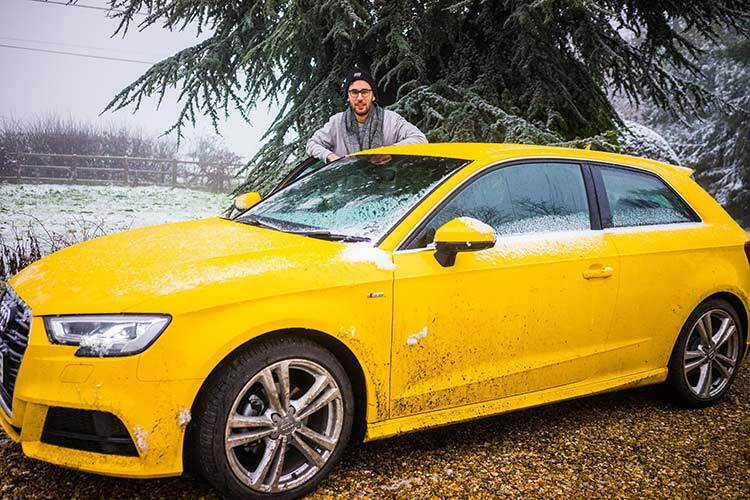 Most importantly it’s fun, which is something the lower-end Audi’s have sometimes lacked. This is an Audi you can genuinely go out and enjoy yourself in, all without breaking the bank. 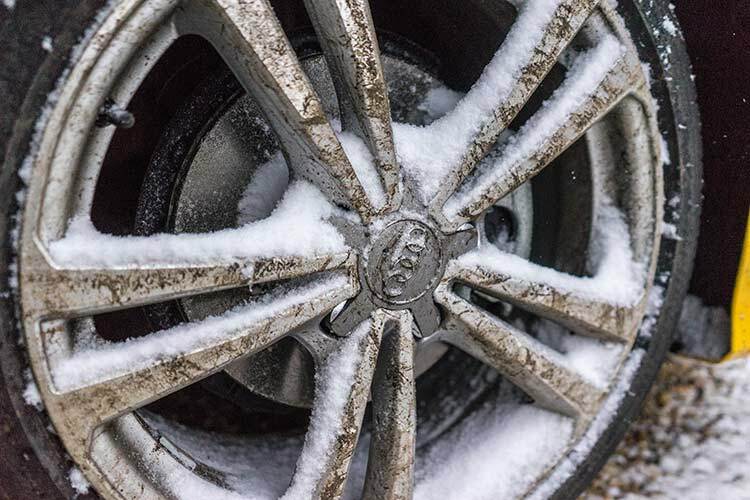 It’s safe to say we’re fans… Sadly Audi may not be fans of ours, as after a weekend of mud/snow/rain the A3 was caked in dirt… Sorry! Model as tested £30,965 OTR. Cars are my life and blood. I graduated from Oxford Brookes University with a First Class Honors degree in Motorsport Engineering. Today I work within the historic motor sport industry, working on some of the rarest and most valuable cars in existence.